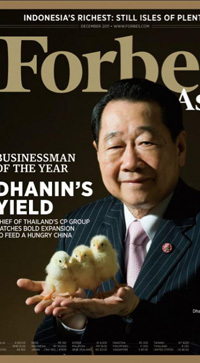 Singapore — Forbes Asia has named Dhanin Chearavanont as its Businessman of the Year in 2011. The 72-year old head of Thailand’s Charoen Pokphand Group (CP Group), Thailand’slargest non-state conglomerate, is recognized for transforming the group into one of the world’s top global food powerhouses and raising rural incomes, and for building China’s biggest megafarms. Dhanin was ranked asThailand’s richest man with a net worth of US$7.4 billion in Forbes Asia’s 2011 Thailand Rich List published last September. During the past five years, he has transformed CP from a disjointed collection of local commodity businesses into a branded, high-margin, global food company complete with its own supply chains and distribution channels. Today, CP has become the world’s top maker of animal feed, the world’s biggest shrimp farmer and one of the world’s largest poultry producers. It operates in 17 countries, including Taiwan, Vietnam, India, Sri Lanka, Russia and Turkey, and exports to some 40. In Thailand, CP runs the world’s second largest 7-Eleven chain with more than 6,000 shops, as well as some 500 CP Mart fresh food stores. CP profits from every step of the process in bringing food to consumers’ tables: with interests in hybrid seeds, livestock, animal nutrients, antibiotics and vaccines, poultry and pork, frozen cooked meals, retailing. Dhanin’s strategy of “from farm to fork” has helped double the group’s annual revenue to $30 billion in the last four years. CP expects revenue to reach about $34 billion this year, and profits to exceed last year’s $2 billion. Commenting on the award to Dhanin, Tim Ferguson, Editor, Forbes Asia, said: “China is the great story of today's Asia but it is obviously not limited to Chinese nationals. Khun Dhanin's is the seminal case of an "outsider" - in fact a returning son - who has returned not just to enhance his fortune in China but to renew the Chinese nation in the process." It is in China where Dhanin is leaving his most lasting mark. Now in the midst of spending $10 billion- including government funds- on building out food production in the world’s hungriest market, the CP chief is changing Chinese lives and raising the bar for his own companies. In China, it will develop cutting-edge projects that will churn out vast quantities of eggs, poultry, pork and produce each year. These plans will culminate in April next year with the opening of an automated egg factory near Beijing that will produce 840 million eggs ayear. Later, a $1.2 billion farm in Zhanjiang City, Guangdong Province, will begin raising 100 million broiler chickens and one million pigs a year. Other farms are under construction or under planning in Zhejiang, Jilin, Xinjiang, Liaoning and Tianjin. Dhanin is highly regarded in China, where for decades CP is ranked as the country’s biggest foreign investor. Presently half of CP’s sales are generated in China, and Dhanin is better known among Chinese than all but a few of China’s own businessmen. A poll published in 2009 by Chinese Economic Weekly ranked Dhanin as China’s fourth most important business leader and top among foreigners. In 2008, he was elected the first president of the Overseas Chinese Entrepreneurs Association. Entering China is considered as Dhanin’s smartest move. When former Chinese leader Deng Xiaoping was trying to boost the farm sector, Dhanin’s proposal to him was the“Three Benefits” philosophy. He explains: “When we invest somewhere, we must benefit the nation and the people as well as the company. If we don’t, then someday the government might just tell us to go home. ”CP Group was founded in 1921 as Chia Tai, a shop selling seeds in Bangkok’s Chinatown, by Dhanin’s father, Ek Chor Chia, and uncle, who had emigrated from Guangdong Province. In 1946, the company was renamed Charoen Pokphand, which means“prosperity for consumers” in Thai. Over the next two decades, CP branched out from seed into feed, farms and grain trading. It set up feed mills in Hong Kong, Taiwan and Malaysia. Of Ek Chor’s four sons, Dhanin was the youngest but had such a flair for business that he succeeded his father as chairman at age 30. More on Dhanin, the Forbes Asia Businessman of the Year in 2011, can be found in the magazine’s December issue, which is available on newsstands now.